Matt Crafton, driver of the No. 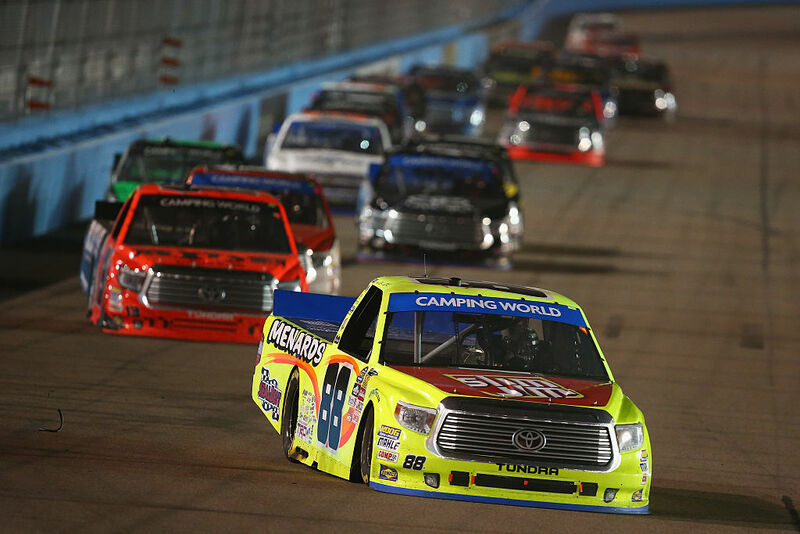 88 Slim Jim/Menards Toyota Tundra, made his 16th career start at Phoenix International Raceway (PIR) in Friday night’s NASCAR Camping World Truck Series (NCWTS) Lucas Oil 150. Showing speed in both practice sessions on Friday, the ThorSport Racing driver backed up his efforts in qualifying Friday evening, earning the 10th starting position for the 150-lap event under the lights in the desert. Battling a Toyota Tundra that was, “free on entry, and tight through the center of the corners, and off” Crafton maintained a position inside the top-10 throughout the event. With every position on the track at a premium to advance into the final Round of the Chase, Crafton was able to secure a spot inside the top-five with 30 laps to go, and never looked back. The two-time NCWTS champion would cross the stripe in the third position behind race winner Daniel Suarez. The third-place result was Crafton’s sixth top-five finish in 16 starts at PIR, and allowed the Menards driver to clinch a spot in the ‘Championship 4’ for the NCWTS finale at Homestead-Miami Speedway next Friday night. How were you able to race yourself into the championship battle next weekend? How stressful was tonight’s race? The NASCAR Camping World Truck Series (NCWTS) had two practice sessions on Friday at Phoenix International Raceway (PIR) in preparation for Friday night’s Lucas Oil 150. Matt Crafton was fourth, and eighth, in both sessions, respectively. Making his 16th career start at PIR in the NCWTS, Crafton started 10th, ran as high as third, and finished third in the 150-lap event. In 16 starts at PIR, Crafton has led 15 laps en route to six top-five, and 11 top-10 finishes. Matt Crafton will advance to the ‘Championship 4’ which concludes the inaugural NCWTS Chase at Homestead-Miami Speedway next Friday night. Following Friday night’s Lucas Oil 150, Toyota was able to clinch their ninth NCWTS manufacturer championship in 13 seasons. ThorSport Racing was one of three Toyota teams that helped accomplish the feat in 2016 with Matt Crafton contributing to two of their 13 wins. In 22 starts in 2016, Crafton has one pole (Atlanta), two wins, and has led 436 laps en route to eight top-five, and 15 top-10 finishes. In 383 career NCWTS starts, Crafton has earned 12 poles, led 2125 laps en route to 13 wins, 97 top-five, and 225 top-10 finishes. Crafton’s ThorSport Racing teammates finished fourth (Cameron Hayley), 11th (Rico Abreu), and 14th (Ben Rhodes). Up Next: The Ford EcoBoost 200 at Homestead-Miami Speedway on Friday, November 18 at 8pm ET.